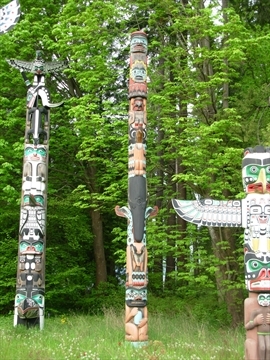 The Sky Chief Totem Pole is a colourful pole depicting many animals such as a kingfisher, killer whale, snake, and wolf. "Our art comes from spirituality. Even after the onslaught of another culture, our spirituality and our beliefs are alive. In this pole we wanted to acknowledge the arts and ceremonies of our grandparents' gneration and show that the arts are her today, just as we are here--alive and intact"
Hesquiat artist Tim Paul and Ditidaht artist Art Thompson carved this pole in 1988 to represent important characters in Nuu-chah-nulth history. The photo caption says: Welcome figure at Ohiaht villiage, 1911. Although totem poles are well known, many kinds of wood sculpture are carved by Northwest Coast First Nations. The picture of the totem pole has a Sky chief holding moon, then a Kingfisher below that, then a Thunderbird below that, then a Whale below that, then a Lightning-snake below that, then a Wolf below that, then a Man of Knowledge holding Topati below that. 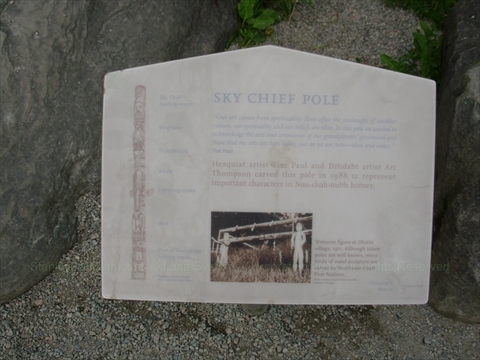 Where is the Sky Chief Totem Pole in Stanley Park? 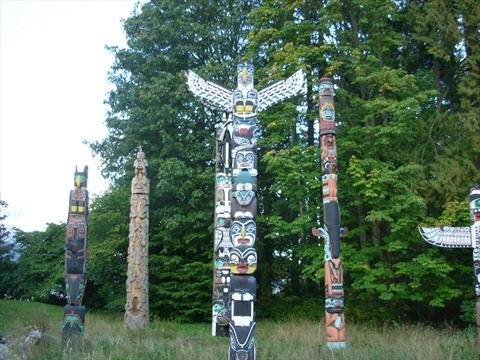 The Sky Chief Totem Pole is located with many other Totem Poles in a display area at Brockton Point in Stanley Park, Vancouver, BC, Canada.